The PCC meets on the third Wednesday of each month at 7:30 p.m. in the Millbrae Library, 1 Library Ave., in Millbrae. All newsletters are in PDF format, which requires Adobe Reader or a compatible web browser. If you need Adobe Reader, get it here. Click on any newsletter thumbnail to open the issue in your browser. Hover your mouse over the newsletter thumbnail to see a summary in larger type. Visit the Photo Galleries to see photos from each issue. Meeting Back To Library. Banquet May 18 Harry&apos;s Hofbrau. Tickets Dave Santana. FAA Registrations Info. Dream Machines Sun 28 Apr. Happy New Year. PCC Holiday Party was postponed. Lew Chee resigned as Secretary. Wire Keepers. Rain! Wind Generator Failure Explained. Isidro Soloed. John South Video. Mike Briggs Is The New Secretary. PCC Banquet, May 18, 2019. New Meeting Place, Back To The Millbrae Library. FAA Registration Details. Swap Meets. PCC Holiday Banquet Jan 20th - Lew Chee for tickets. Membership Renewal. Crushed Concrete delivered and spread. FAA UAS Registration. FAA UAS registration. No Smoking or Alcohol Drinking at PCC. Take Your Trash Home. Watch For Passing Traffic. New Gate Installed. Model Flying Down Under. The Lock Explained: How To Open It. Clean Up after Yourself and Your Pets. Connector: Real or Fake? Rico&apos;s Celebration Of Life April 20th. New J&M Hobby House Hours. Pacific Coast Dream Machine April 29th. No Smoking at PCC. Lock The Lock Properly. New Float Fly Venues. New Airshows Dates. New Lock Combination Effective June 1st. Wasps and Bees. Club has 105 members. Lock Code Changed. Castle Fly-In. Gold Country Club. 5 mph on driveway. June meeting minutes. Oakdale Float Fly canceled until further notice. Safety reminder and locking procedure. No Trash Service. Gate Lock Revisit. TX Modes. Open Cockpit Day. Wind Generator Installed. In Memoriam: Gary Ware. Take Trash Home With You. We Moved To New Field 10 Years Ago. Pumpkin Traffic Is Upon Us! PCC and AMA Membership Renewal Reminder. Best In The West Jet Rally Report. Bayside Auction Oct 27th Fremont. NO DUST on the Driveway! Membership Renewal. Need New Meeting Location. PCC Holiday Banquet. Happy New Year. Storm Report. New Application Policy. Holiday Banquet January 21st, Harry’s Hofbrau. Rain! Flying Field flooded! Field Rules Reminder. Holiday Banquet Report. New Membership Policy Explained. February Meeting Minutes. 2017 AMA Expo West Report. 2017 Membership Survey Result. Field Rules Reminder. Lock The Gate When you are the Last One out! March Meeting Minutes. Flight Pattern. How To Paint By Jake. April Meeting Minutes. Hiller Biggest Little Airshow. Los Banos Scale Fun Fly. Slope Flying At Del Valle Regional Park. May Meeting Minutes. Hiller Biggest Little Air Show. Woodland-Davis AeroModelers Is in Operation Again. Control Line In Bay Area. Wayward Drone Fly Over. June Meeting Minutes. Sticking Velcro. Airport Day San Carlos. Meeting Minutes. PCC Visits Coyote Hills. DVD From A Former Member. Schedule. AMA ID Sticker. 2017 September Meeting Minutes. Foreign Report: Float Fly In Japan. Bayside Auction Donation. PCC Work Party October 21st, 22nd. Jake Is Safe. 2017 BITW Report. Bayside Auction Donations. Work Party Good Turnout. Meeting Minutes. Work Party Photo Report. Membership Renewal. In Memoriam: Warren Olson. FAA UAS Registration. PCC Holiday Banquet. New President OF PCC. Simone Olson. PCC Holiday Banquet. Photos From 2016 AMA Expo. Meeting At Temporary Place Till March. Meeting Minutes. Goodbye Simone. Eagles VS Drones. Board Meeting Report. Lost Battery. Banquet Pictures. Epoxy Crystallization Explained. President’s Corner. Rudder Control. Basic Aerobatics Trim. RC Flying And The Law 2016. May 15th PCC Open House. Scale Gliders And Ellsworth. Hiller Museum Biggest Little Airshow Report. Solar Impulse 2. Youth Visit on June 18th. Volunteers Needed. Safety Rules Revisit. Field Maintenance Day July 9-10. New Lock Installed. President’s Report. Club Officers Needed. New PCC Mailing Address. Work Day Photos. New Meeting Place At Peter’s Cafe, Millbrae. Looking For A Secretary. The 2008 Move. New Membership Badge For 2017. Labor Day BBQ Report. How To Select Your First Radio, Part 1. Flying Field Photographs. September Meeting Minutes. New/Revised Rule. Ellsworth Crowell Passed. October Meeting Minutes. Gate Lock procedure. 2017 Membership Renewal Form. Driveway Repaired. Goodbye Ells! Warren Olson Turning 91. Best In The West Report. Happy New Year. PCC Holiday Banquet. Martin Newell Micro P-51D. Members Photographs. January Meeting Minutes. Event Calendar. PCC Holiday Banquet. Field Pictures. PCC Open House March 22, 2015. Know Your Current Draw. Lake Hennessey Float Fly Report. HMB Review Visit PCC. PCC Flys At Dream Machines. Wear Your Club Badge At the Field. Field Clean Up Party May 16-17. The Balsa Story. PCC At the Dream Machines, A Pictorial Report. Turbine Usage Meeting Coming Up. How To Use A Caliper. Upcoming Events. Alonzo Richardson Passed. Gas Turbine Ban Lifted. Storage Container Moved To The Field. What’s Going On In My Shop. August Newsletter Posted. First Super Sonic Jet Liner. Eric’s Photo Platform. SACRC Waldo Pepper Fly-In. PCC Field Rules Review. Ca SB 142 Vetoed. Tag Your Equipment. Lake Hennessey Float Fly. Impromptu BBQ Day. Meeting Minutes. Lipo Battery Safety. Looking For An Instructor. PCC and AMA Dues Due! HMB Airport Rename To Honor Eddie Andreini. PCC Holiday Banquet on January 23rd, 2016. No More Printed Newsletter. New Officers Installed, New VP Rich Symmons. PCC Holiday Party January 18th, Harry’s Hofbrau. Turbine Flying Stopped Due To Dry Weather. PCC And AMA Dues Due. January Meeting Minute. Christmas Photo Report. Club Decals. Shrinking A B-17. Happy 97th Birthday Alonzo! PCC Oceana Interim This Week. Simple Aerobatics. FIRE! Field Fire Caused By Illegal Launch of Rocket. 2014 Oceana Interim Report. Alonzo And Ellsworth’s Birthday Celebrition. Something about Sunglasses. Work Party Report. IMAA Castle Fly In. AMA Number. After Run Mixture. Impromptu BBQ. Meeting Minutes. AMA Needs Your Support. Free Chargers Give Away. Ellsworth Becomes The First PCC Life Member. Helping Out A Fellow Modeler. Chance To Flight. Servo Data Base. Ken and Gary, Winner Of Simplex Smack Down. Visitors From Utah. Lithium Battery In Transmitter. New Photographs Collection. The Nadler’s and Olson’s Moving Out. AMA and PCC Dues Are Due. Donated Aircrafts For Sale. Blast From The Past, A Pictorial. New AMA TFR’s. October Meeting Minutes. Foreign Visitor. New Engine. Holiday Banquet January 24th, 2015. Officer Nomination At the December Meeting. PCC Dues are Due. Preflight Check List. PCC Holiday Party. Membership Renewal. New Year’s Day At Richardson Field. Tips And Hints. Party Report. Year-Bar Available. Stay-Brite Product Warning. Liquitex Varnish. Happy Birthday, Alonzo! Oceana High School Interim. Jake Moved North. Field Camera Weather Station Update. Pacific Coast Dream Machines Show. Oceana High School Interim Report. Starter Scale @ SACRC. Meeting Pictures. Turbine Season Is Over. Pacific Coast Dream Machines Report. Jake’s New Shop. LiFe Battery and Voltage Regulator. May Meeting Minutes. Who Am I - W. Olson. 2013 Castle Mini-Fest Pictorial Report. Fire Safety. Summer Is Here, May be. Unsung Hero of PCC. Rally of Giant Photo-Report. Some Rules Of The Air. Bees Gone! New Toilet Installed. News From the World(Yes, Santa Rosa!). Radio Maintenance. Lake Hennessey Float Fly Sept 28. Safety, Electric Power Arming. Enya Engine Repair. Deadman Pass Slope Soaring. New Wind Sock. September Meeting Minutes. Field Photos. Bring Your Trash Home With You. Warren Hackman. Renewal Time Again. Setting Up Your Servos. Its Christmas! PCC Holiday Party January 18th, Harry’s Hofbrau. Officer Election at December Meeting. Pacific Northwest Aircraft Museums. Holiday Banquet January 21st. Tickets Available From Ray S. 2012 New Officers. AMA Expo Mini Report. Sig Manufacturer Has New Owners. Banquet Report And Photos. Hangar Flying At Eddie’s. Prez Sez. Looking For New Meeting Facility. President Signs Bill To Protect Model Aviation. Lake Hennessey Float Fly Report & Pictures. Alonzo Turned 95!!!!! Oceana HS Interim March 26-30. Dream Machines Volunteers Needed. PCC FieldCAM Installed. Propeller Safety. PCC At Dream Machine. Interim Session At Oceana. Oceana Student Visiting Ames Research Center. Ellsworth’s Corsair at Hiller Museum. Charging Station. Battery Talk. 2012 IMAA Mini-Fest Report. Goodbye Mr. Atkinson. PCC SACRC Invitation Event. Visiting Switzerland. Re Introduce Flight Proficiency Program. SACRC-PCC Flyin &BBQ @ SACRC. Lipo Detector. Hints and Tips. PCC/SACRC Open House BBQ. 10 MPH Speed Limit On Field. Field Camera Update. PCC/AMA Membership Renewal. PCC-SACRC Fun Fly. Another Lake Hennessey Float Fly. AMA FPV Guideline. PCC Web Cam Updated. WInter Flying in Half Moon Bay. Holiday Banquet Early Bird Special. Holiday banquet on January 19, 2013. Interim At Oceana Coming Up. Happy New Year! AMA & Club Renewals Past Due. Work Parties to Smooth the Runway. Help Our Class at Oceana High. How to Set Up Multiple Digital Servos. CYA Blues. Dennis Reports on the PCC Banquet. Time for Annual Preventive Maintenance Check. Indoor Flying Resumes at Oceana High School March 3. Here’s a Better Way to Install Mounting Screws. Come Teach at Oceana High School. Donate Your Old Bags of Concrete. Indoor Flying at Oceana HS is a Success. A Visit With Our Friend Kirk. PCC/Oceana Interim class visits Ames Research Center. Aeronautics for Grade Schoolers at Redwood Shores. IMAC: Matt Wins at Salinas. Spy Photos from SFO. Matt takes over as the PCC Web Master. 2011 Top Gun Report. Float Fly coming up. Outreach News. Meeting Location Changed. Castle IMAA Mini Report. Upgrading The Runway. Protecting Yourself From Hazardous Materials. Meeting agenda: Updating runway. Lake Hennessey Float Fly. Who Am I, Jim Reimholz. Remember Kirk Phaling. Who Is Mickey? Donating Excess Modeling Stock. Field Repairs. Runway Updates. Who Am I? Greg Romine. NMUSAF Virtual Tour. October 6th Indoor @ Oceana. Clear Da Prop, Looking For A New Man..... Work Continues On The Runway. Lake Hennessey Float Fly Report. Last Indoor Event. Field Is Open. Dues Are Due, Got Your 2012 AMA Card? Officer Nomination. Who Am I is Back! Christmas Banquet. Dues Are Due, Got Your 2012 AMA Card? Dennis’s Last Stand. Futaba 9C Transmitter Woe. 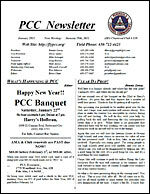 Want an earlier issue of the PCC newsletter? You'll find issues from 2000 to 2010 in the Newsletter Archive. Go here for a map and driving instructions. ©2003-2012 Peninsula Channel Commanders. All rights reserved.